Bringing you the best of the Vieux Carre! For more than 200 years, the world renowned French Quarter has excited, intrigued and charmed locals and visitors alike. From the lore of voodoo and spirits from beyond, to its quirky characters, unique shopping and world-class dining, the legendary party Mecca promises something for everyone. Also known as the Vieux Carre, the oldest neighborhood in New Orleans is bounded by oak tree-lined Esplanade Avenue and bustling Canal Street, the mighty Mississippi River and historic North Rampart Street. You'll discover treats and treasures as you stroll along notable Royal Street, which is bursting with art galleries, antique shops and quaint boutiques. Just steps away you'll find infamous Bourbon Street, where the party never stops! Celebrated jazz music bellows from club after club, as lively adult libations freely flow along this illustrious strip. Packed with history, acclaimed Spanish and French influenced architecture and year-round festivals, the Quarter is a continually named a "must visit" destination by travel experts worldwide. 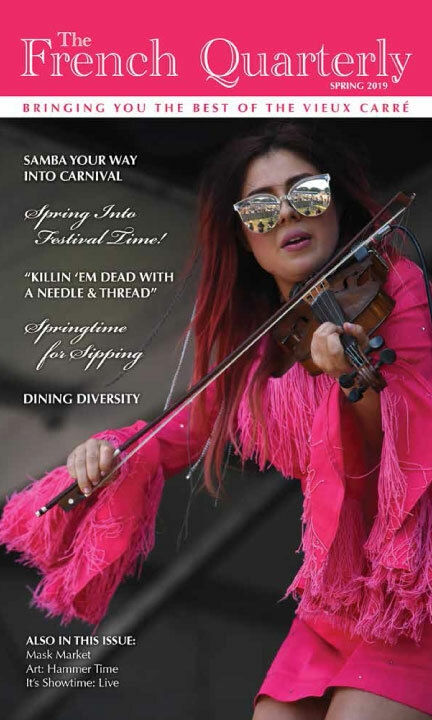 As the eyes, ears and palate of this one-of-a-kind gem, French Quarterly Magazine is proud to bring you the latest scoop on where to shop, what to eat, who's in the spotlight and when the cool things are happening in the Big Easy. FQM Jumps Canal Street and Opens its Pages to the CBD and The Warehouse District! !